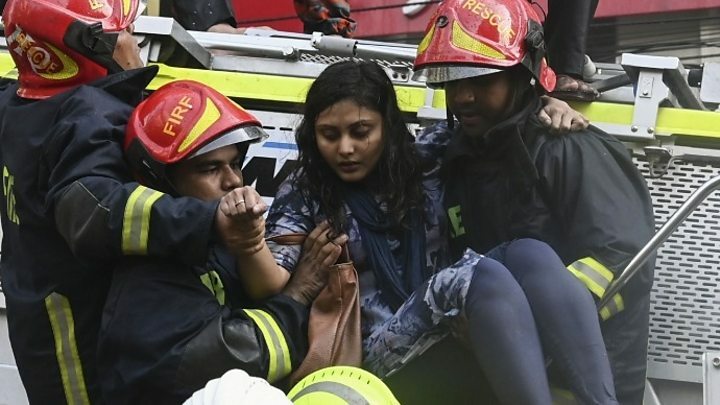 At least 19 people have been killed in a huge blaze in a high-rise building in an upmarket commercial area of the Bangladeshi capital, Dhaka. Seventy people have been injured, a spokesman for the local fire brigade has told the BBC. Firefighters have now entered the building after the fire was brought under control. The death toll may rise further, as dozens are feared trapped inside the 19-storey office block in Banani. They are believed to have been situated on the upper floors of the building, above where the fire broke out. Fire crews, backed by members of the navy and air force, were called to the scene to tackle the blaze. Dozens of people have been rescued. Last month, a massive blaze in Dhaka's old quarter killed at least 78 people and injured dozens more. That same month, a fire in a slum in the coastal city of Chittagong killed at least nine people. Dhaka, with a population of more than 18 million, is one of the world's most densely populated cities. Some 3.5 million of its people live in slums, according to the World Bank.